This is the fastest (wearable) garment I have ever made. I made this in about two hours, and if I weren’t a mother of four, who knows how quickly I could have done this without interruptions? The mind boggles. 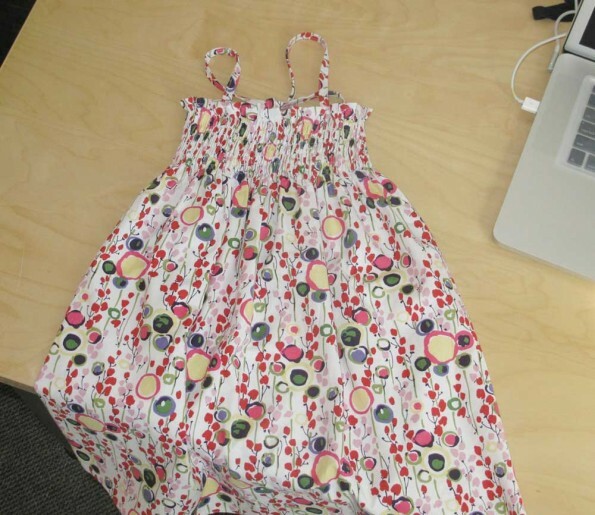 This is the Heather Ross Smocked Sundress. 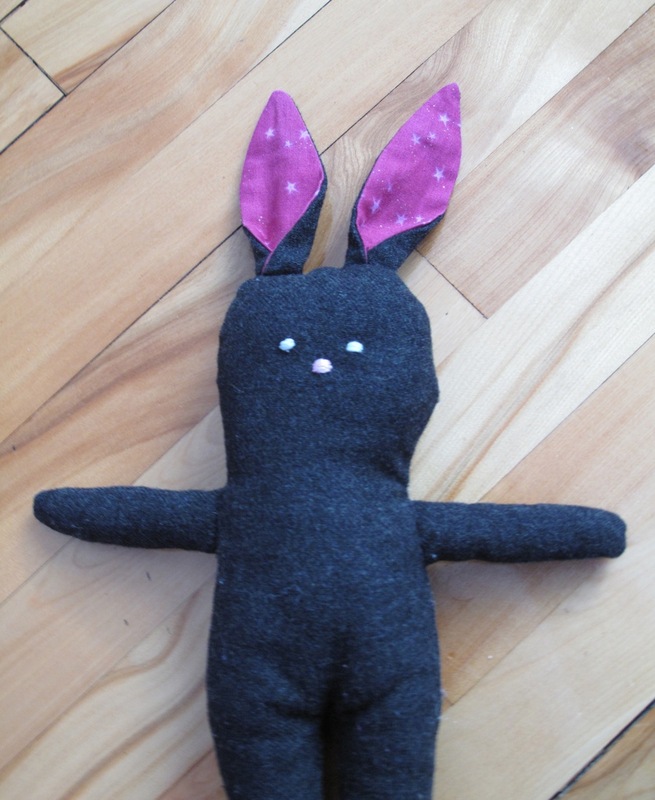 You can find the free tutorial on the Martha Stewart website where there is a video as well, or in Heather Ross’ book Weekend Sewing (though the reviews of the book are not kind). 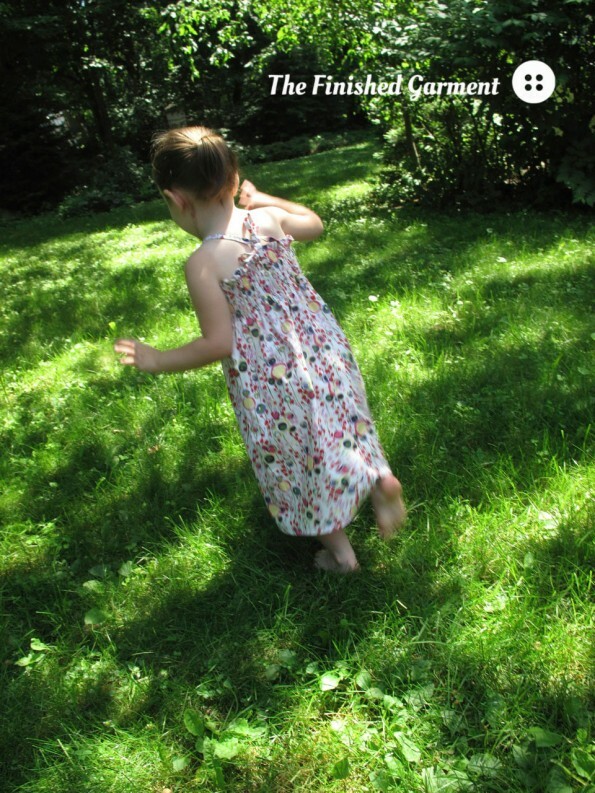 There is also a pattern for a larger dress for women, the Mendocino Sundress Pattern available to download, also for free. The main criticism of her book seems to be that there are errors in the instructions and missing details. I found the instructions for this project to be alright – I mostly skimmed them. But then I’m an experienced sewist, perhaps a beginner would find them more problematic? I didn’t have any problems with the smocking with elastic thread. It was incredibly easy. My machine handled it beautifully. 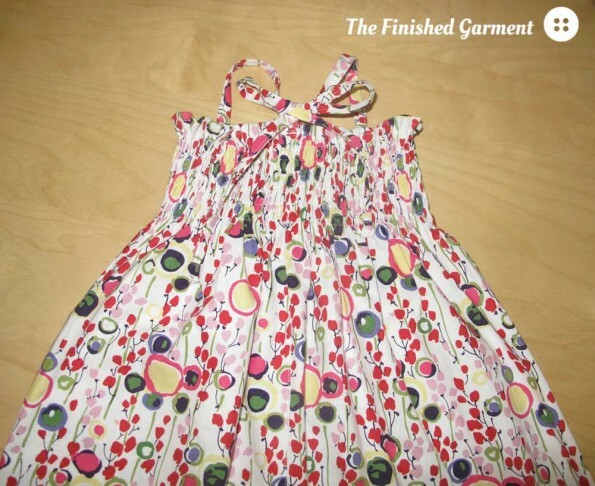 There also isn’t a lot of seam finishing in this dress, since most seams are enclosed or involve the fabric selvedge. Yay! And fitting isn’t that much of an issue, since the dress has a lot of give in the smocking. This dress fit perfectly. I only made two changes. First, I cut the dress a bit shorter than I had intended (oops! 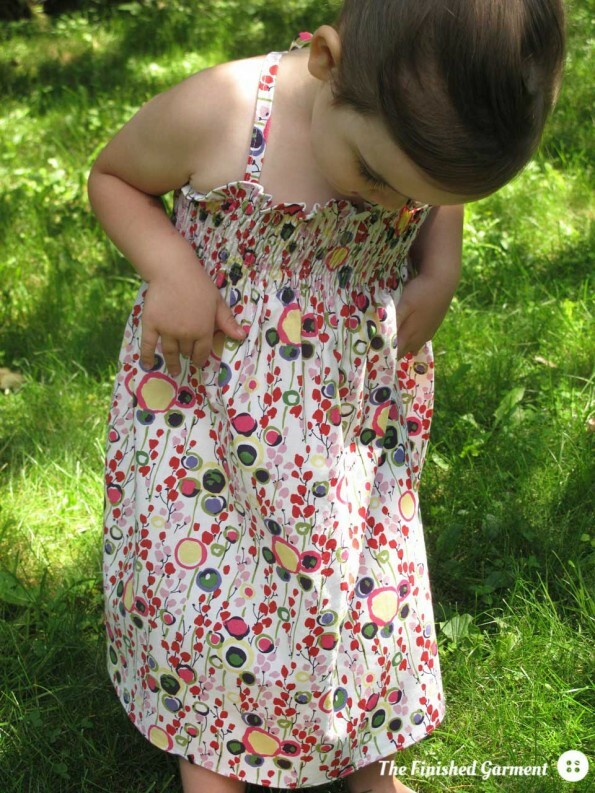 ), and so I hemmed the dress with a narrow hem, instead of the wide one in the instructions. It’s still quite long, so it should last a while. Second, I changed the straps. 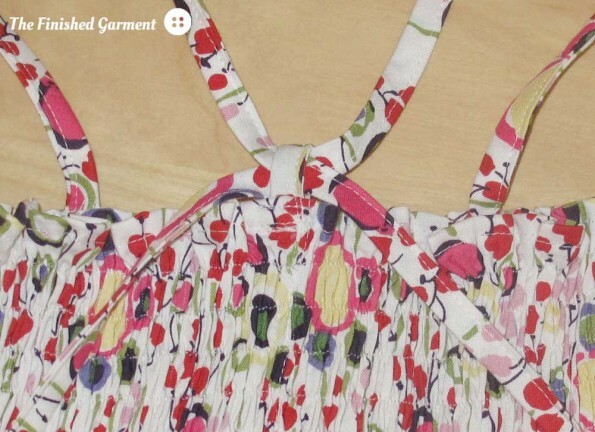 The directions call for four straps that tie in bows at the shoulder. It’s a cute look, but those ties always come undone. Instead I used two straps, and fed them criss-crossed through a small loop in the centre back. I anchored the loop very securely with extra rows of stitching. This way there is one bow in the back, and it can be tied more securely. Here you can see how I made the straps work, by running them through a small loop. 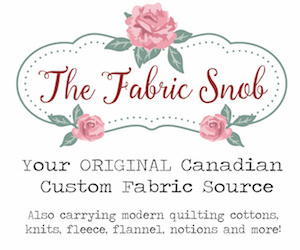 Let’s talk fabric! 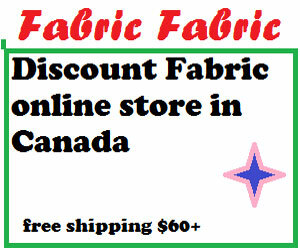 This is quilting cotton, which is great for summer – so breathable and super easy to work with. The print is Monkey’s Bizness Market Floral in the bright colourway from Alexander Henry. I really like this print. It’s a floral pattern, but not too girly. I’m not one for ruffles and frills and bows and often floral patterns are either a little too old or a little too saccharine. This one is perfect and the scale of the print is really nice too. Even my husband said it was “so pretty” (and this almost never happens!). I used a narrow hem instead of the wider one in the instructions. Another great thing about this pattern is that it doesn’t use a lot of fabric. 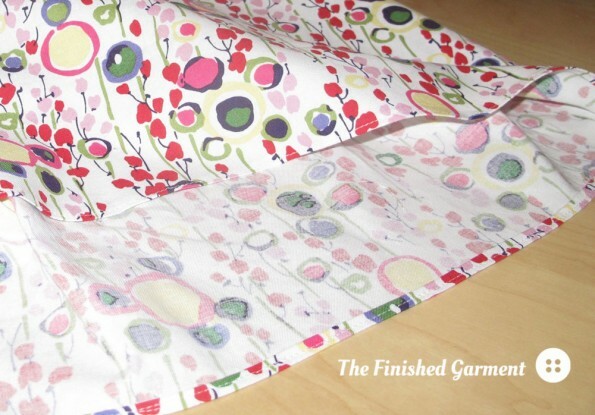 I only had one yard of this fabric, and I only used 2/3 of that. I did cut the straps on the straight grain though. If I had cut them on the bias, I would have had less fabric left over. I really like the way the straps tie in the back. I’m really happy about the results. 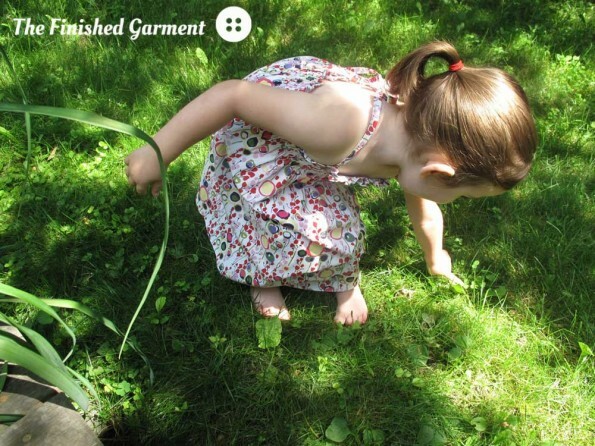 I wanted something cute and easy to sew, especially after the more advanced linen shirtdress I made recently. This was both. And my daughter really loves it and says it’s super comfortable as well. Yay! This is a really comfortable dress. I’m seriously considering making the adult version. This is a Warp & Weft Sewing Society project. Esmari of Warp & Weft Exquisite Textiles has some great fabrics. Lots of quilting cottons, but other things as well, including some really unique finds. Right now there are three of us in the sewing society all creating projects using her fabrics. It’s quite fun, because we could all be using the same fabric, but of course we’ll come up with such different results – so much creativity! 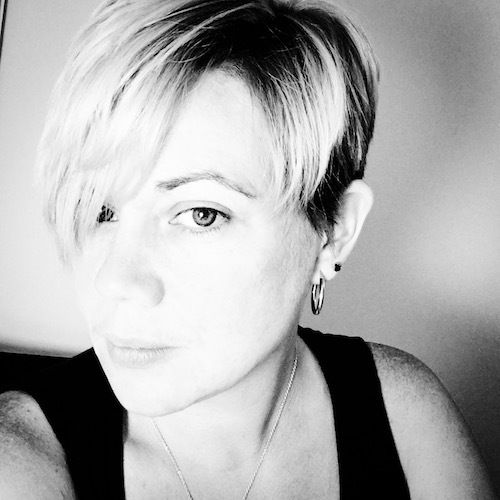 Be sure to check out the other Warp & Weft Sewing Society members, Cynthia and Carla to see what they’re up to. 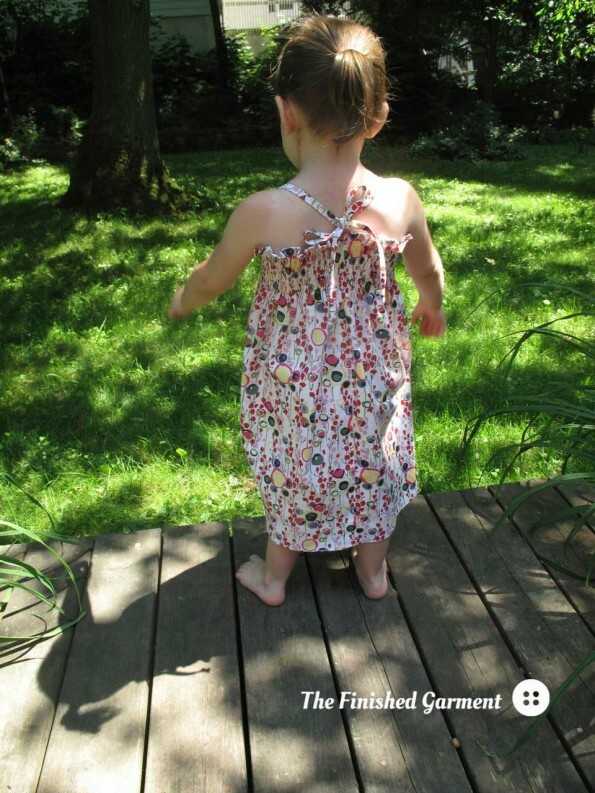 Pattern Review: Heather Ross Smocked Sundress. 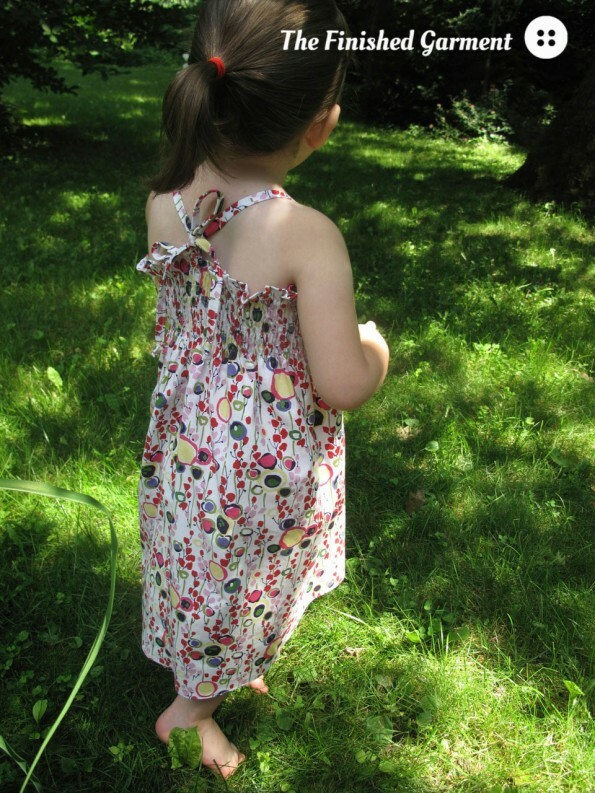 Size: (by measurements), though my daughter is usually between sizes 3 and 4. Fabric: Monkey’s Bizness Market Floral in the bright colourway from Alexander Henry. 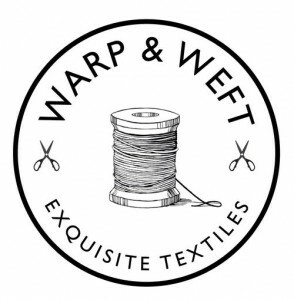 Available from Warp & Weft Exquisite Textiles. Modifications: I changed the straps to tie in the back and made a narrow hem instead of the wide hem in the instructions.. Results: Cute. Unbelievably quick to sew.